Angoori says me and tiwari are on fire, vibhu says you two are been defamed in town, Angoori says we know its not to get romantic in public, Vibhu says good you two realised,angoori and tiwari start getting romantic infront of vibhu,vibhu tries to ask them to stop, but none of them listen and kiss, vibhu comes out boys waiting for them,vibhu slaps tilu, tilu asks why, teeka says you said party, malkan says how about malai chicken,vibhu starts hitting them. Anu asks vibhu for coffee, Vibhu removes all his frustration on her, anu says you are cribbling as if im the one responsible, vibhu says i don’t know,do what you want, anu says you are fed up of me,i can see it, pack my bag im going to my parents. Anu calls Meenal and tells her about going to her parents, Tiwari asks where to, anu says I’m going to my parents for few months leaving this house, tiwari starts crying like kid,anu says what is all this im just going for some time, to teach vibhu some lesson, Tiwari says you giving him licence to misbehave,and have fun, anu says not to worry he has no money,tiwari says what are friends for,i mean he will be out of your control,anu says is it im not going then, vibhu walks in and says taxi is here, Anu says im not going. vibhu says good anu isnt able to see what Angoori and tiwari are upto,but will also go mad seeing my reaction.anu calls vibhu, Vibhu gets her haldi milk,and asks are you upset,anu asks why will i,who am i to you, you don’t care about me, vibhu starts massaging her leg,anu says yes break both my legs no one loves me. Vibhu on streets blind folded and calls someone to help him and drop him home, Hapu walks to him and asks whats wrong, Vibhu says tiwari is such a bac character and also included bhabhi with her,hapu says even i have seen that, infront of my police station, Angoori and Tiwari walk to them and sign hapu,hapu tricks vibhu in talks and asks him to remove blind fold, Vibhu sees tiwari and angoori kiss and while about tk run away gets hit by a bike. Prem takes Vibhu to hospital, prem says did you find my scooty to die, Gupta examines vibhu, and says its just a sprain, you will be fine in 2 days,vibhu says how will i rest even anu is resting, doctor says use these supports return when you are fit and 2000 charges,vibhu says prem pay 5000 as compensation.prem hands him money. Vibhu cribling and walking around, he hears Angoori and Tiwari follow him and kiss, and run away. malkan asks badami about confusion about her parents and Gulfamkalis, badami has something irritating her eye,malkan helping her,vibhu sees them mistakes them and scolds them,hits malkan,malkan tries to explain, but Vibhu listens nothing and hits him. pre cap : vibhu having dinner with Angoori and tiwari,both kiss eachother. 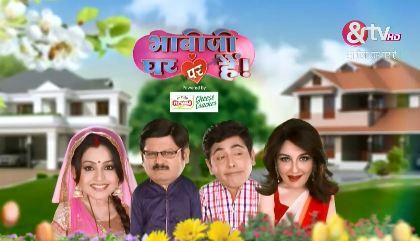 The post Bhabhi Ji Ghar Par Hai 27th February 2019 Written Episode Update. Vibhutis frustration appeared first on Telly Updates.